September 28, 2007 .Reading time 5 minutes. Finishing a quilt top is a great feeling and definitely a milestone in the quiltmaking process but “getting to the quilting part” from there is not as direct as one would think. 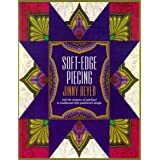 How do you know what quilting designs will look fabulous and “make the quilt?” How do you know what to quilt where? Sure, there are lots (like hundreds? thousands?) of quilt stencils out there, and I seem to have my own private collection of them, but for some quilts stencils just don’t cut it. Yes they make the quilt easier to mark, but how many times are you going to find the perfect stencil, in the perfect size and style, for a particular part of the quilt? Not many, in my experience. For some quilts, you need other tools: pencils, freezer paper, rulers, compass, flexible curve, circle and feather templates, and ink pens. Oh, and erasers, lots of erasers. Let the intimidation begin. Freezer paper is one of the essential ingredients to this torture. You know, that stuff that people who hunt their own food use to wrap meat? I’m no hunter, but I go through a wicked amount of freezer paper when I quilt. I use it for everything. The rough side makes great drawing paper and though it’s strong it’s also fairly thin, which becomes important later. You can just tear off a chunk in whatever length you need (great for long border designs) and when you run through the whole box, the grocery store has more. September 20, 2007 .Reading time 3 minutes. The misery rolls on with this quilt, as there are times it seems that it’ll never get done. Okay, I’ll admit that it hasn’t been the top priority lately (though I can’t really figure out what HAS been the top priority, just not the quilt in any case), but I really need to be getting on with it if it’s going to be done by Christmas (ha!). Oh, yeah, did I forget to mention that I finally had to set a (possibly fuzzy) deadline for completion? I don’t like to do that to myself because then I get stressed, but I had to aim for something, just to have a goal here. I think maybe the edge of the open toe appliqué foot is just hitting the edge of the lighter fabric at times, and at other times it sort of slips off the edge, and then I get wobbles. Since there are multiple layers of fabric and fusible web here, I guess I’m not surprised, but it is frustrating. When this happens we get to pull out the X-acto knife and rip this tiny satin stitching with the lovely silk thread out. A very sharp X-acto knife is the only way I’ve figured out to get the stitches out easily, and without tearing up the fabric or stretching it out and making a complete mess of it. There is that slight risk of cutting right through the fabric of course, which would necessitate a much different usage of the X-acto knife if there wasn’t any Prozac handy right then. I think Shadow thinks it’s time for bed, not quilting. He’s quite the little manager. If I’m not in bed early enough to suit (think “right after dinner”), he bugs me until I get there, sometimes for hours on end. Obviously he’s aptly named…pest that he is! August 14, 2007 .Reading time 5 minutes. Can you see the roots of this design in the carving on the buffet? I loved those little curved edges around the central medallion on the buffet, and they soften the line of the oval, and add a bit more interest. I can hardly wait to get to the quilting part to add to the effect! I’ve planned to put sixteen medallions, eight each of two different sizes, in the outside border of the quilt. The embroidery designs are all just a bit different, since the feathery magnolia and leafy designs are all actually separate embroidery files that you can put together any way you like and stitch them out. If you look closely at the background of the medallion on the buffet, the wood has been textured in some way, so it almost looks like stippling, in person anyway. I don’t know that “textured” is the proper term, since I know just enough about wood carving and furniture making to appreciate it, and nothing more, but you get the idea. I’m planning to quilt The Misery Quilt in #100 silk thread, and will probably put some insanely small background pattern around the flower in the medallion. The medallions are fused together, by the way, and I’ll do satin stitching with the silk thread on the edges like I’ve done in other places on the quilt. I’ve come to realize that many of the reasons quilting attracts me the way it does go for antiques as well. Character, individuality, the unmistakable stamp of loving hand craftsmanship, finely wrought details, and the sure ability to stand the test of time; all these things are inherent to both antiques and quilts. Is it any wonder? Even the excitement and satisfaction of the search is similar: when you find the perfect antique that you just love (and can afford, and have a place to put!) you get that warm, fuzzy feeling, just like when you’ve found the perfect fabric for your current project, or you’ve tried some new technique or design solution and it’s given the project new life and made it better than you ever imagined it could be. What’s not to love about antiques and quilts? July 5, 2007 .Reading time 2 minutes. Do you think it doesn’t matter where you are, you can still be creative? Not so, or at least not completely so. And just to be clear, I’m not talking about your creativity, I’m talking (or grousing, as the case may be) about mine. My creative energy level is heavily dependent on my location. Here’s the vicious cycle: The design and construction process on the quilt is going well, a new idea hatches, experiments take place and the experiments look good, until I realize that I need x, y or z to really make it all work, and I can’t get my hands on x, y or z (because of my current location here in Germany) without ordering it from the States and waiting a week (or more) for it to arrive so I can continue on my merry creative way. Much angst and gnashing of teeth ensues while trying to find a way to avoid ordering x, y or z, but still make the new idea work. No good, and creativity comes to a screeching halt and the energy and enthusiasm levels plummet. Rinse, repeat, ad nauseam. In this particular instance, x happens to be Sulky rayon embroidery thread in colors that are evidently not sold in Germany. Why this should be since the dang stuff is made here is completely beyond me. Maybe I could try a different brand of rayon, but I already have lots of Sulky, and it comes in spools of a reasonable size for someone like me, who just dabbles in the machine embroidery thing. I have some spools of Isacord, and they’re so huge, I’ll probably not get through them before it rots, and they’re more expensive anyway. And yes, it’s The Misery Quilt, again. If it ever gets to the quilting part, I’ll believe in miracles. I guess I’ll go pack it all up, and try to find something else to work on until my thread gets here. /grousing done now, thank you. July 2, 2007 .Reading time 5 minutes. Some quilts are meant to be, and some aren’t. Some fly together in flashes of inspiration, but others can take up hours and hours of time (not to mention the yards and yards of fabric) and still fight you all the way to the last stitch on the binding. Some quilts are labors of love, while others call forth emotions of a far less complementary nature. “The Misery Quilt” is truly living up to its name at this point, inspiring those “less complimentary” emotions at every turn. Last week, I threw in the pencil and got back to the machine to stitch up what I thought would be the perfect borders for this quilt. I put two of the finished borders on it last night, and I wasn’t happy with it. Again. I decided a retreat to my bed was in order, since it was late, and I was hoping things would look better in the light of day. Don’t think of this as a retreat to the old comfort zone, but as a confirmation that your first ideas were the right ones. Sometimes the cliché or obvious ideas are the first ones you come up with, so you need to work through the problem to get to a more interesting solution. But often, our gut instinct knows what to do right away. I’s still beneficial to work through the options though — to confirm that your gut really did know what it was talking about.